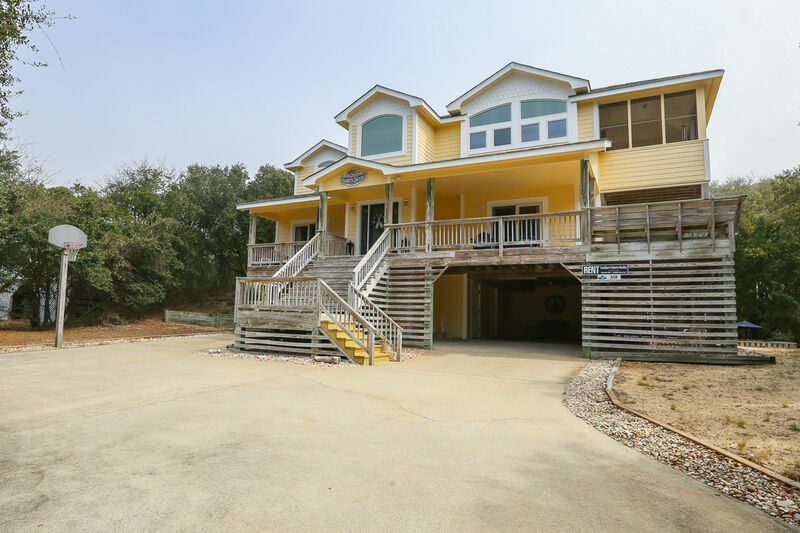 This spacious 3,300 square foot living area with 1,800 square feet of decking, beautifully decorated, well-equipped home located in a quiet cul-de-sac will make a memorable family vacation at the beach. 410 yards to beach by paved path. Near bicycle trails, tennis courts, and shopping. Recreation room with games, TV with Blu-ray player, stereo/tape/CD player, small refrigerator and microwave, full bath. 4 bedrooms (2 master bedrooms 1 with King, TV with Blu-ray player and 1 with Queen and TV, each with private bath; 1 with Twins, 1 with Pyramid bunk with Trundle) bath (with tub and shower) laundry room. Large great room with vaulted ceiling, TV with Blu-ray player, stereo/tape/CD player. Sit down dining for 10, kitchen with extra seating at center island, powder room. Master bedroom (with King, whirlpool tub and separate shower, TV with Blu-ray player, and walk-in closet). Have been to The Outer Banks time and time again. This has been the most beautiful home yet! Clean, bright, beautifully decorated, everything you need right there! Such attention to detail. You can clearly see how much the owners want you to enjoy your vacation and hope you return. Highly recommend. Looking forward to returning and once again renting through Southern Shores Realty.